Here's some more awesome airplane nerdiness. 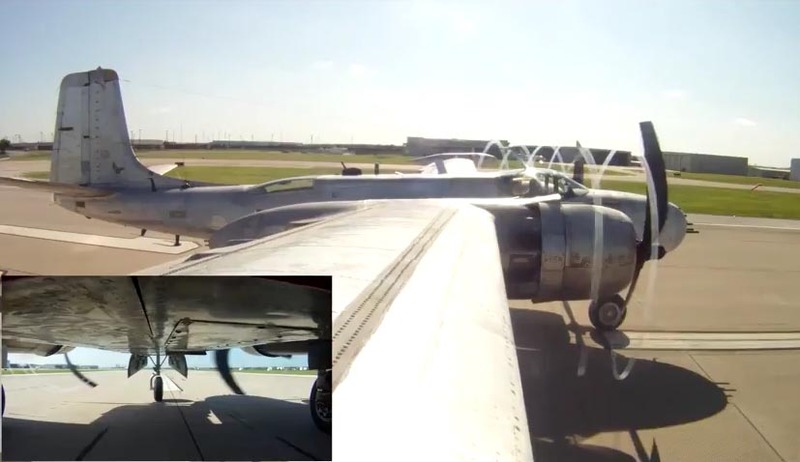 This is the complete footage from the Tip Tank Camera and the Belly/Bomb Bay Camera. The bomb bay camera's battery dies first so the last few minutes is just the wing tank. It dies just before landing. It's about 1.5 hours of airplane noise and the pilots doing their check list items. Nice views of the areas around DFW as well. Scott WRG Editor: I added a screen cap image. Great point of view! Me too, Baz! A nice little thrill besides witnessing the culmination of a long-followed project. Yes, that T-6 in our hangar is an authentic member of the "Red Checkers" flight team. It is not just a paint job. Two of our guys fly it although it is owned by fella who splits his time between Alaska and Texas. On another note, got my turn flying Kay for a bit. She is still flying tight and smooth like a new car.... only smells better! We have close to 5 hours on her now. There are the usual little problems to fix but remember she is a 72 year old airplane even though she has had several makeovers. In July 1945, she returned from England to the US and was being prepped to continue to the Pacific War but the atomic bomb interrupted the plans. We are thankful that she and a lot of GI's were spared having to invade Japan. Kay went on to a sedentary life of towing targets for aspiring fighter pilots, but now that I think about it, student pilots with live ammo making gun runs on that sleeve was probably more dangerous than flying combat over Europe! Zane, I'll be updating Special K's registry entry tomorrow, Mind if I snag some images for it? Thanks Scott and Zane! Zane got some incredible pics of the 75th anniversary celebration of the first A-26 flight in 1942. Kay behaved at least for that day. She now is demanding more attention. So it will be a little bit before we resume flight operations. We are still looking for a paint shop willing to help us out since we got the paint donated. Having a hangar big enough is part of the equation as the wings are a tad over 70 feet and the tail about 20 ft high. Can't hardly wait to see her all decked out in SEA camo. It will be a standout at airshows. Ironic, huh? A "can't see me" paint job ends up being highly visible in the new arena!! here's all the latest info on Kay and we don't have to mess w photobucket. Greetings tonight all the way from Bozeman, Montana. Saw Kay's old home at Billings on the way. Meanwhile back at the hangar, the team has changed out the number 8 & 9 cylinders on the left engine. The problem with the landing lights was solved by finding secret Circuit breakers in the nosewheel well. The surface prep continues getting ready for paint. A few other odds and ends are being taken care of before the next flight. Also, we are hoping to fly the T-33 this coming w/e if we can fix an intercom problem. Check our Facebook page for pics and more on the story! We are happy to have Chuck back from Oshkosh to join the Day Shift and get the left engine finished up. The team will run the valves on Saturday to complete that chore. Big Ed worked on the right main gear actuator to dry up some leaks. Jeff is continuing the Scotchbrite cleaning in prep for paint. The T-33 is ready to fly on Sunday if the weather cooperates. T-storms in the forecast for Sat & Sun. Larry the avionics guy put his magic touch on the mic problem! Be sure to check back for the latest news! The left engine run found two bad plugs that were replaced. A subsequent run showed a perfect mag check and a smooth running engine. That's the good news. The bad news is the left generator decided to take a vacation so more troubleshooting to do. The dynamic avionics duo figured out the problem with the cylinder head temp indication. Over on the T-33 side, it had two successful runs down the runway to prove out the fuel feed system from the tip tanks. We were about ready to fly when the nose strut and right main strut decided they had had enough for one day. Sppppppsh. It was like having a flat tire on your way to a big party. Bummer! But there is always next week to see what else these old airplanes will try next. We almost think they are adversely allergic to sunlight and fight all efforts to get them out of the hangar. I first met "Special K" about 8 years ago, and have been following the progress, and have donated $ and some tooling, supplies , etc. I was given and had a surplus of said items. I am confused about the glitches with the "rebuilt" engines. Is there any warranty for said work done to engines? Spark plugs I understand, a little short lived, but pistons and jugs ? How many hours since "rebuild" on Mona and Lisa? I know there is no comparison but I had a rebuilt engine put in my truck and it came with a 3 year, 75000 mile warranty, still running after 12 years. Plan to visit relatives in Cowtown someday soon and visit "K". Well, yes, we have been frustrated by engine problems. The right engine was overhauled and then seized shortly after installation due to a bearing failure in the counterbalance of the supercharger drive. It made metal so the whole engine was torn down again, cleaned and inspected by the overhaul shop that did the original work. It is one of the few shops that offers a warranty, but we still had to pay shipping each way which amounted to over $3500, plus the three months lost. Wish we could get a warranty like your engine, but the best any shop will do is 100 hours. Some of these 2800's make it to 1000 hours before overhaul. At $67,000 for an overhaul, the engine reserve fund needs to be paid at double the rate per hour because it might only get to 500 hours instead of a 1000. So many things can go wrong. Our left engine is midtime, but has needed four cylinder changes due to excessive oil leakage and bad valve guides. We expect to do three or four more in the next year or so. A cylinder assembly with piston has been running about $2200. The left vacuum pump just failed. It was overhauled two years ago and had about five hours on it. A replacement is $800. We operate on donations so we have to fix things as the funds become available. We are all volunteers who work on Kay as part of our small Non Profit. These are the things that determine how fast we can go. They are also what contributes to the fun. Seeing her fly for the first time made it all worthwhile. Come see us when you can! Pete, keep in mind we are dealing with a 72 year old airplane. The youngest parts on it were made probably no later than 1960. There is no such thing as a "new" vacuum pump. There are a few old stock that were never installed perhaps. They are hard to find as are parts for overhaul. Old pumps are cannibalized for parts. Sometime they just don't hold up. That was our case. They don't come with any warranty except maybe workmanship. But we got her running today and the generator has been replaced. Will do an engine run tomorrow as well as fly the T-33. Keep fingers crossed.! And thanks for the tooling, die grinders, gloves and that sports drink mix. Need some more of that!